Today we can announce two new shows! We’ll play at this year’s edition of “Rock de Schleek” in Machtum on 15th August. That’s a first for us and we guess it will be fun playing at this well-known festival! click on their logo to get to the official Facebook event! This actually is two news in one! 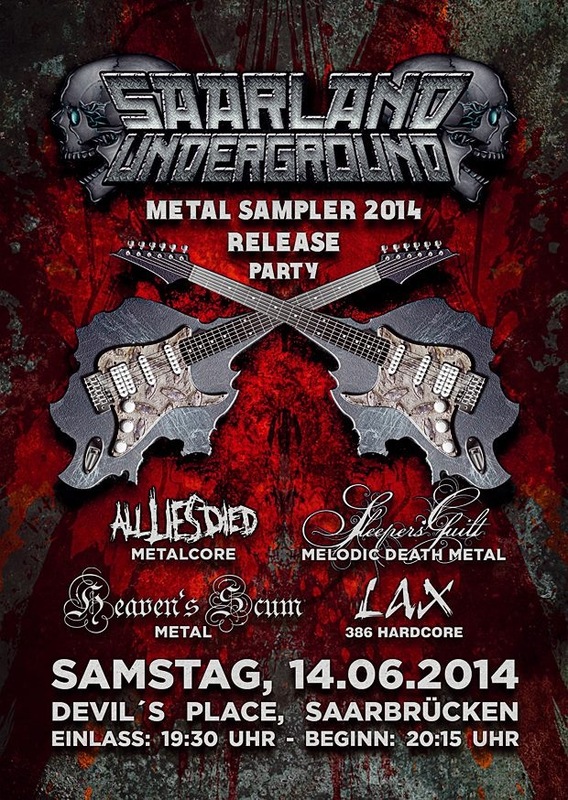 We gonna be on this year’s Saarland Underground Metal Sampler AND we’ll play at the official release show on 14th June in Saarbrücken at the legendary Devil’s Place. If you have a close look at their great flyer you’ll realise that our über friends from Heaven’s Scum will play as well! This should be a very interesting event for everyone living in or around Saarbrücken! This entry was posted on 6. May 2014 by Sleepers' Guilt. It was filed under Shows and was tagged with All Lies Died, Captain Risiko, Devil's Place, heaven's scum, IRINA, LAX, Luceed, Maka Mc, Open Seas, Resomus, S.k.o.r, Saarbrücken, Saarland Underground Metal Sampler, SUMS, The Jacob Conspiracy, The Neverminds, Toxkäpp!.